WHQL-certified versions of Catalyst 10.6 display drivers are available. You can download Catalyst 10.6 HERE and read the relase notes HERE. For OpenGL fanatics, the complete list of OpenGL extensions is available HERE. OpenCL 1.0 conformance tests have not been run with this version of the ATI Catalyst Driver Suite in conjunction with the ATI Stream SDK v2.1. If you require an OpenCL 1.0 conformant driver, we recommend that you install the ATI Catalyst 10.5 Driver Suite. What about memory clocks in idle when ATI overdrive is on? Are they still too high in idle like in 10.5? 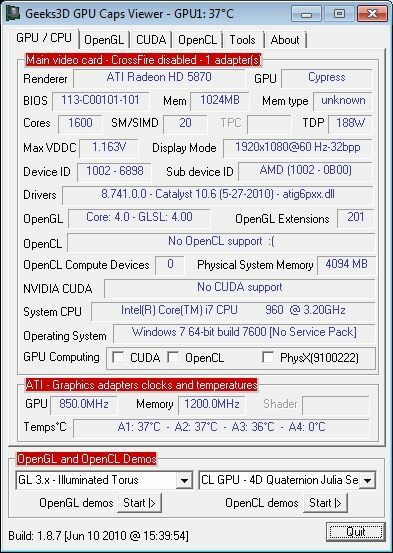 Dmitry: Don’t enable ATI Overdrive, and the clocks are fine. long time wait this thing_! I dont have any problems with games based on Quake 3 engine, my radeon HD5850 play games such COD1, Quake3, Medal of Honor Allied Assault without any problems. My OS is Windows Vista 64 and Catalyst 10.6 WHQL.